The conclusion of Kurt Busiek's Eisner Award-winning series Astro City is here, as over 20 years of graphic storytelling comes to an end! This legendary series goes out the way it burst onto the comics landscape: telling everyday stories from the viewpoint of those who walk the streets alongside the spectacular heroes of Astro City. * Meet G-Dog, possibly Astro City's most unusual superhero ever. Half man, half dog--but who's running the show? The answers will change a life, reveal another hero's deepest secrets and possibly, just possibly, save the world. Oh, who are we kidding...they'll definitely change the world. Do you see that handsome face? * The story of Resistor, who's making headlines all across the nation. And one reporter is determined to find out the truth--not simply to report it, but to find her missing father. A story of protest and power, love and loss, and an enigmatic, ever-changing hero. * Michael Tenicek lost his wife, years ago, to a chronal cataclysm. But he's not the only one in Astro City whose life has been upended by life among the superheroes. Today we'll meet others, learn their stories and see how Michael--and friends--cope with their trauma. A sequel to the Eisner-nominated "The Nearness of You," considered by many to be Astro City's best story ever. 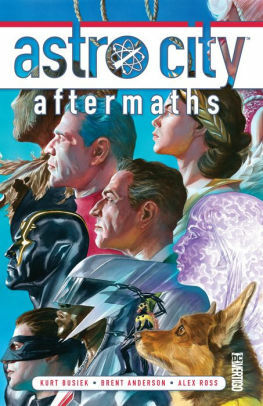 The Astro City periodical series wraps up here, in Astro City Vol. 17. Collects issues #47-52.